Lord Narasingha and the hunter…………………………… MAATHA NARASIMHA PITHA NARASIMHA BRATHA NARASIMHA SAKHA NARASIMHA VIDYAA NARASIMHA DRAVINAM NARASIMHA SWAMI NARASIMHA SAKALAM NARASIMHA…..
Near the banks of the river kaveri in a gurukulam the guru was revealing pastime of the divine Lordships . He was emotionally charged and was bringing the real situation what the great devotee bhaktha prahalada was facing and how Lord was taking care of his custody . The Guru went into the minute details how Prahalada was tortured by his demonic father every time he chanted the Holy name . There was pin drop silence everywhere as he continued to describe the appearance of the Lord …. why is HE not here!! in this pillar? With demonic eyes he thundered ..Come on!! Allow me to kill you and let me see how your most worship able Lord comes to protect you. With terrible anger, the demon stuck his heavy fist against the pillar. There was lightning thunder and a forceful sound that could make the entire universe into pieces. The demigods thought the planets were about to collapse. Suddenly from the huge Pillar a roaring sound was heard that could crack the universe. A countless lions roaring together…..The roaring made the earth shiver..
All the disciples were attentively hearing to their Guru.. The demon Hiranyakasipu laughed and looked closely at the form of Lord from the pillar . The Lord was looking extremely fearsome . His angry eyes like molten gold, shining mane added ferocity to the lovely face. The dreadful teeth, razor sharp tongue , erect ears the cave like nostrils , the mouth slightly parted jaws , a huge body that touched the sky, short well-built neck , a broad chest, thin waist and the lovely body hairs like the rays of moon. His long arms spread in all directions . The Guru continued , just as small insects falls forcefully into the fire, the demon got attracted to the lovely form . The mighty Lord became invisible. Hiranyakasipu attacked the Lord with his mace .Lord who was full of effulgence allowed the mice to crawl . The scene was as Garuda plays with a snake by slowly releasing and again holding , the Lord left the demon a little and allowed him to come back to fight. Making a huge noise, shrill sound of laughter, the Lord of Lords Narasinga deva captured Hiranyakasipu like a mice , and hit him on the strong chest. With greater speed, the demon was tossed sometimes in the sky and sometimes on the earth. The demon kept his eyes closed because of fear of the Lord and His thundering roared laughter. Ultimately , Lord Narasinga dev placed the demon on HIS lap supporting him with HIS thighs, on the doorway, at twilight and effortlessly tore open the demon into pieces with HIS sharp nails thus Lord’s mouth and mane were sprinkled with blood. HIS fearsome eyes, full of anger were just impossible to look at. Licking the edge of the mouth with his tongue he simply threw the body aside. Manifesting in full effulgence angrily HE roamed in the corridors and sat down on the assembly hall on the throne. No one, out of fear could dare to come near. Brahma requested the devotee Prahalada … My child !! Lord Narasingha deva is extremely angry .. Please go and appease Him as LORD has appeared only for You. Prahalada with folded hands walked near LORD and fell down flat to pay his obeisance’s . The Lord ever compassionate placed his lotus hand on the head thus gracing the child devotee….. Among the disciples , Sanandhana a young lad was shedding tears . Who will not shed tears hearing Lord Narasingha devas divine leela. Sanandhana instantly fell in love with Lord Narasingha deva … The sloka what his Guru chanted dissolved in his memory .. He was chanting the sloka and relishing the Lord’s majestic form . 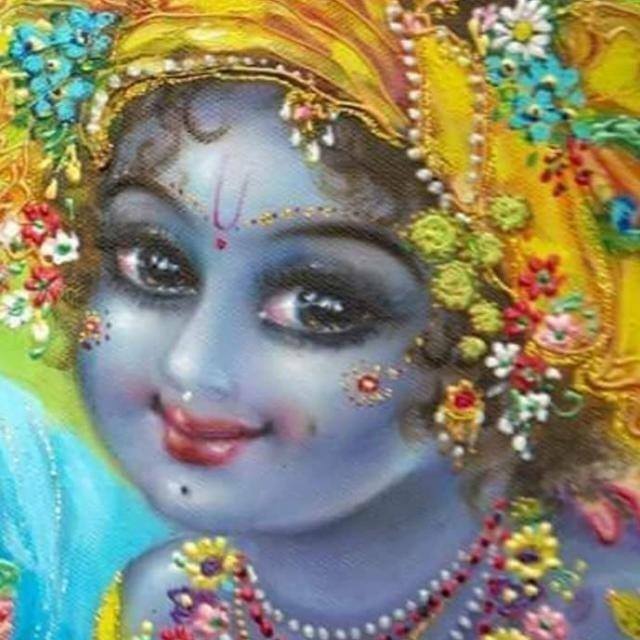 He kept recollecting the divine pastime shedding tears .His mood was stuck to the divine appearance. He recollected Lord’s compassion on Prahalada for every demonic act done by his father Hiranyakasipu. His mind was contemplating on Lords’ arrival. He decided, he must also seek Lord’s real darshan.. The class was called for the day .All the disciples walked out . Guruji! Can I also have darshan of Lord like Prahalada ? Why not my child ..
After all ! LORD is more eager to meet us .. Please bless me so that I can also have Lord’s darshan like Bhaktha Prahalada . The thirst to see LORD grew by leaps and bounds . Sanandana was in a different mood . He was bodily present in the class, but his mind was absorbed in the verse his Guru chanted!! I must…I will meet the LORD …. But How?? How will HE know my craving? He waited for the class to end . He once again walked near to his Gurujee and said ! Acharya!! Please once again tell me the divine pastime of Lord. The thirst is never getting quenched and please tell me how can I see the Lord face to face .Please instruct me what penance must I do to seek his lotus feet like Prahalada . The guru understood his steadfast devotion to LORD . He replied !! My child ! Lord is ever compassionate . Tomorrow is a Full moon day . Take a holy dip in kaveri and meet me in the Ashram altar . Sanandana was eager and desperate for the sun to set soon. All the while chanting the sloka he thanked the Lord for his mercy in being with a learned Guru who was about to advise him the mantra that shall have his darshanam. The next day , Sanandana rushed to kaveri for a holy dip . Praying the Lord he rushed into the altar before time, awaiting his Guru to bless him . The Guru offered his prayers to his Acharyas and lordships. It was full moon day. He called Sanandana and said , Look my child I am teaching you the holiest of holy Mantra, the Mantra Rajam. He said, “My child , This sloka was glorified by Paramasivan himself. It also is called Narasimha Raja Patha Stotram. Sanandana listened to the mantra carefully and repeated along with his Guru. He was corrected for the pronunciation and slowly mastered the sloka repeating it with his guru . The Guru glad with his determination said …..
My child ! The sloka must be chanted with sincere prayer to seek his lotus feet . Chant as many times as you can, but with sheer love and dedication. May all auspiciousness follow you and May Lord Narasingha dev bless you . The Guru blessed the child and offered his prayers to Lord. Sanandhana happily leaves the Ashram and the surrounding villages. He finally arrives near a jungle .Walking inside he crosses many bushes and hillocks .Feeling proud about his Guru choosing his candidature to initiate him with the mantra he is puffed with pride . The Spiritual pride had invisibly germinated in his mind . Silently chanting the juicy sloka ” mata narasimha pita narasimha” he looks for a serene place for meditating . Somehow he reached a mud cave. He finds the place serene and calm . He decides to meditate on Lord exactly at the same spot .Clearing the debris , he makes a seat for himself . Sanandhana is suddenly woken up from his meditative mood. On opening his eyes he finds a hunter in a shabby dress holding sharp knives. Punditjee , You are so young and look like ashram boy? What made you come here in this jungle? Are you lost here by chance ?? Sanandhana was getting irritated with this hunter’s nonstop bla bla. He looks at him and says …. Hey Man! Don’t you see I am engaged in an important mission. Please leave me and allow me with my worship! The hunter is worried .He innocently appeals …….. Yes! He can kill them from a distance… I mean it …..
You mean ….Half lion, half human. If HE is here… then! I will catch him the hunter said with confidence. The hunter replied… Is it a challenge …? Ok! Then I accept it…. Sanandana was glad that the hunter was engaged ……He continued to meditate and chant the sloka with attention ………………………. The sun has already set … Oh! I am left with just few hours….. come on.. Oh! Animal… I am starving today itself for you, come …. come… please. He did not go home. He did not sleep at all. He was aimlessly wandering in the moonlight expecting the animal to appear ..
Imagining the animal…. half human… What a sight?? How will his eyes look and how will he walk? The imagination took him to mystic world. He fell in love with the animal. He admired it for the perfect appeal. He loved it more than Sadananda. One time! Please…. come near. He spoke to himself ….. I promise you I shall not harm you… No weapons… But ! please…. look !! I am starving and decided I will remain like this until I see you. He said to himself. Looking at the stars, he imagined the beautiful form of the animal. His mind was stuck and he dozed off to sleep on a slanting cliff with the background of waterfalls . He suddenly woke up to the chirping of birds. He walked near the waterfalls…Refreshed himself …. He walked into an old cave where hunters usually offer their prayers before their hunting expedition . He looked at the ferocious form of demi god there. With tears he submitted one time please save me and my tribe! It’s my word and your word too . He became too weak. Deprived of food, sleep waling into the woods, he pleaded the animal to appear. The sun has finished his half way. He realizes that he was left with just few hours. What a life am I to live without hunting. Let me accept my defeat in dignity. He feels ashamed! Let me end my life. Why must I show this face to Punditjee . Feeling disgraced , he walks near the cliff of the huge water falls. Putting all his might , he decides to jump in the flowing waters and end his life. One last time, He meditates on the beautiful form of the animal Sanadana described and submits. In fraction of seconds, he heard a herd of lions roaring causing echo all over the jungle . He shivered though the feeling was ecstatic. He looked around. Presto !! Unbelievable…. the sight made him cry… what a divine form..
What a beauty… fearing crying .almost weeping with heavy breaths. He sees the wonderful form of the majestic animal Sanananda described. The hunter was aghast looking at the majestic form. No hunger, no fear. The bewitching smile and the penetrating eyes made a huge difference. Now hunter had copious chilled tears. He could not take his eyes out of the sight of the animal. He slipped into a state of timelessness… Suddenly a voice was heard! You wanted me to come!! Here I am! Come let’s move… fast!! The hunter said but… I said, I will bind you and take you to that cave!! The animal laughed heartily. You want to bind me!! Ha Ha… .. The hunter ran shivering thanking everyone , he found few creepers near the waterfalls .With deep concern and sobbing continuously, he checked them to see they did not have thorns. He now fell in love with the animal. He manages to get the creepers…shivering… he approaches him and says ……. The animal replied!! Me too my dear….. but be careful while walking backside as you may get injured due to the rough stones and thorny bushes .. The hunter replied! I don’t care for any bruises , I just want to see your form. They both walked .The sight was special . All the trees moved on their own. ..Chilled tears rolling ..he marched backwards .. Soon he reached Sanadhana.’s cave. Overwhelmed watching the animal …he screamed …. Punditji! You are absolutely right! He is King of Kings!! Please come and see for yourself..
Sanandana screamed! Hey! You country brute! Why are you troubling me? I don’t see anything except some creepers hanging. The hunter replied! Punditji don’t lie!! He looked at the hunter with tears! My dear Hunter! I am not able to see anything. I accept my defeat. I am a sinner …. I am unworthy …. Sanandana pleaded If I at least hear his voice am fortunate ..
where are you? He became possessed now! My child! I was ready to reveal myself to you… But your spitirual pride distanced me away from you. Look at this innocent tribal.. He has not eaten since yesterday and ready to sacrifice his life. I had no option than to come…..
Look Sanandana … It was due to your association with this loving soul that you had the rare gift to hear me.. The hunter was uninterruptedly watching the LORD from close quarters..
Lord replied! 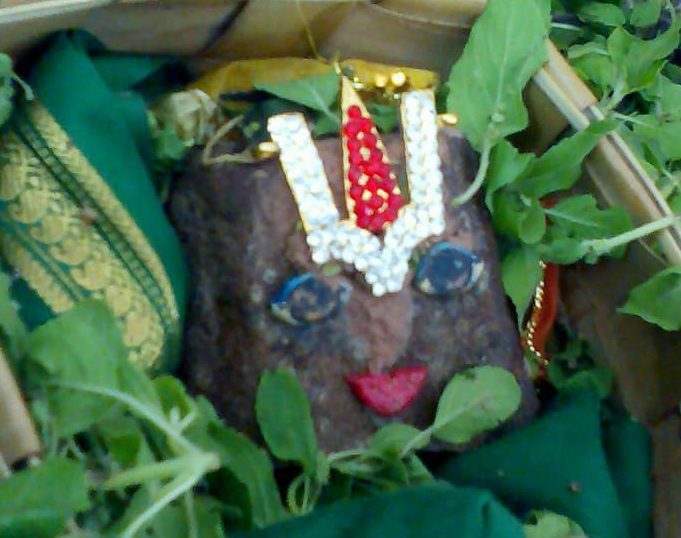 Sanandhana. Leave this forest and go back. You will meet a teacher soon who will take you to spiritual glory further. I shall appear soon … saying so the Lord disappeared……..
Sanandhana fell at the feet of the hunter and asked to forgive him for his mannerisms .. The hunter had already left his body watching LORD’s divya darshanam .. Previous post” RISHIMUKHA PARVATAM ” the holy place where Sri Rama bhaktha Hanumanji met Supreme Lord Rama and Lakshmana for the very first time. The animal had a lovely lion’s face, soft eyes, and the body was human. Almost 15 feet tall. It had a gigantic form. The hunter was aghast looking at the majestic form. No hunger, no fear. The bewitching smile and the penetrating eyes made a huge difference. He could not take his eyes out of the sight of the animal. He slipped into a state of timelessness… Suddenly a voice was heard! Narasimha Darshan today! What a Blessing! Too Inspiring Mantra Slogams! Spiritual Hunter a tribal teaches us volumes… What a Grit, Devotion, Dedication, Daring Spirit! Deathless Attitude! In order to avoid Pride the Ego only, Vaishnavism introduced ADIYEN! – Adiyen Ramanuja Dasan- Jai Sriman Narayana!